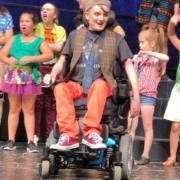 Jake Marrazzo has become a remarkable 16 year old sophomore at Hudson High School who has not let Duchenne Muscular Dystrophy keep him from pursuing his dreams of performing on Broadway, driving a car and helping to cure his disease. Recently, he was chosen to be featured as one of WCVB Channel 5 Boston’s A+ Students and was interviewed by Antoinette Antonio. The segment was broadcast on Wednesday, April 10, 2019 which you can see below. 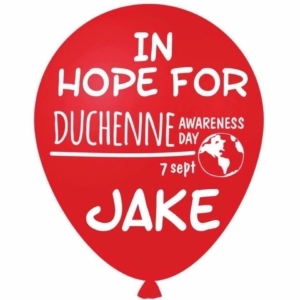 In 2014, Jake’s family and friends created the 4 Jake Sake Foundation which helps families who have been affected by Duchenne. 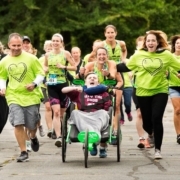 Every year since, we have had a Millennium 5K road race to help raise money for the foundation and this year’s race is on May 19th at the Elks Club in Hudson, MA. We encourage you to participate in the race any way possible – from running the race, walking the course or just spending a great day with your family and ours. There will be a kid’s obstacle course race along with Star Wars storm troopers on patrol as well as other characters who are very strong with the force. We hope to see you at the Millennium 5K on May 19th! 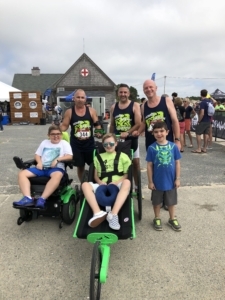 Jake’s Dad, John, competed with two other Dads on the Dudes Against Duchenne Team at the Buzzards Bay Triathlon on September 16, 2018. It is a beautiful course right along the ocean in Westport, MA on Buzzards Bay. The race started with a two mile run with Jake being pushed by John in our Hoyt Chair. Then followed by a fourteen mile bike ride, which included a few hills hills which is a challenge pulling a 112 pound kid and a 30 pound chair! The final leg was a 5K run which John crushed — he was pushing Jake while dealing with a broken handle bar on the Hoyt Chair that we had to take off in the transition area. It was so inspiring that so many of the other participants in the race shouted out words of encouragement to Jake and John during the run. The crowd at the end cheered them through the finish line! The team has raised $1,975 so far that will go a long way to help families buy ramps to make their homes and vehicles accessible for wheelchairs. 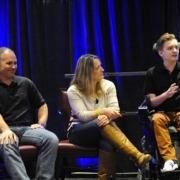 Being with our other Duchenne families has always been our “silver lining” in the clouds of a Duchenne diagnosis. Thanks Steve and Mark for raising funds 4 Jake’s Sake! 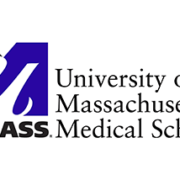 Jake was asked to be a guest speaker talking to first-year medical students at the University of Massachusetts Medical School (UMMS) on September 12, 2018. He spoke to them about what he thinks makes a doctor world-famous. Jake had them laughing which the students told him was the highlight of their day. 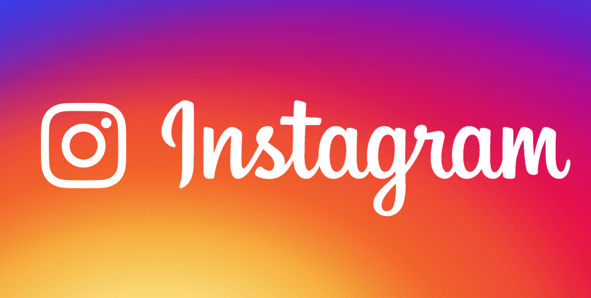 One of the student commented on social media, “My classmates and I loved meeting you! Thanks again for sharing your story with us.” Jake shared the good and the bad about being a patient with Duchenne MD, including how he does in school and living his life on a daily basis. We had a great time and were honored to speak to these young people. Good Luck, future doctors! 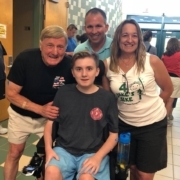 HOPKINTON — Just before 8 a.m. Sunday, Sheryl Marrazzo crouches down and places both her hands squarely on the sides of her son’s face and leans in close until both their foreheads touch. just a few short minutes, Marrazzo will be competing in the annual Title 9 women’s sprint triathlon, which she’s done for the last five years. 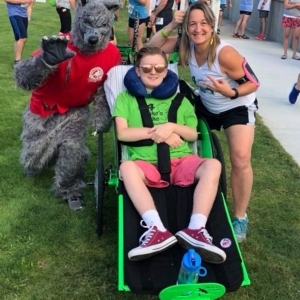 But this time will be different – her son Jake, who was diagnosed with Duchenne Muscular Dystrophy at age 7, will be right behind her the whole time. 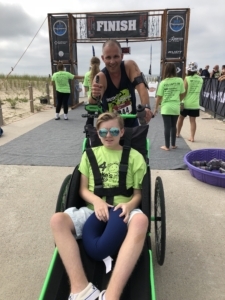 After 25 weeks of intense training, Marrazzo pulled 15-year-old Jake for the duration of the race’s swimming, biking and running courses using both an inflatable raft and a special $5,000 running chair. 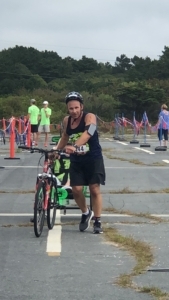 Continue reading the article “Mother, son complete Title 9 triathlon through Hopkinton” at Wicked Local and written by Cesareo Contreras and please click here to watch our photo and video montage from the Title 9 Triathlon race. 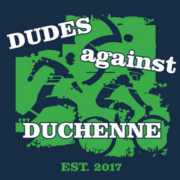 September 7th is World Duchenne Awareness Day, which aims to raise awareness for people living with Duchenne muscular dystrophy (DMD). 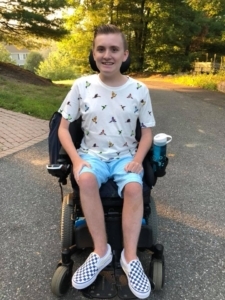 In this blog, Jake Marrazzo, a DMD patient and advocate, shares his experience, providing a powerful story of inspiration to anyone who has been touched by this disease and was originally published by America’s Biopharmaceutical Companies on September 7, 2018. Essentially, this genetic disease means that my body can’t make a protein called dystrophin, which my muscles need to keep moving. Without it, my muscle cells have started to weaken and die off. At age 12, I started using a wheelchair because walking became too difficult. I’m 15 now, but in the seven years that have passed since my diagnosis, I have refused to let this disease slow me down. Getting diagnosed with DMD was extremely hard (although I think it was harder for my parents than it was for me), and I was forced to come to terms with certain limitations at a far earlier age than most people. But at the same time, I’ve learned the value of living life to its fullest in the time that we have. I feel like I’ve discovered myself as a person, and ultimately, I’ve been able to become an inspiration to others. Please visit America’s Biopharmaceutical Companies to read the rest of this article. 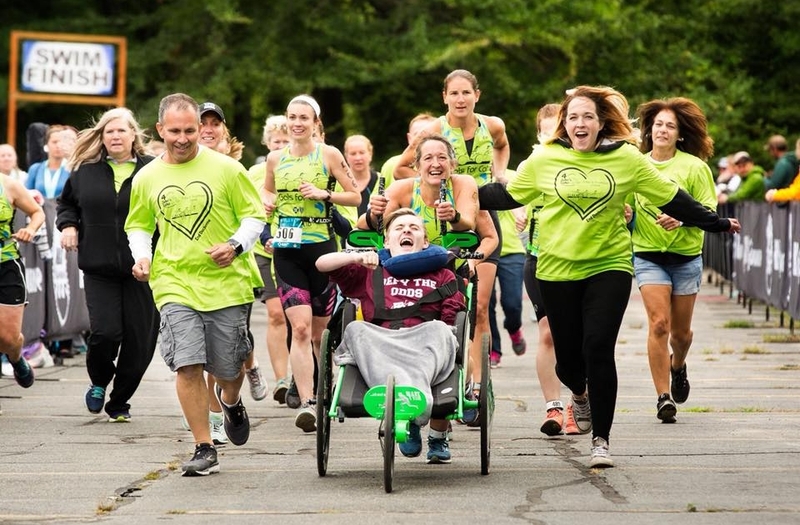 September 9, 2018 – Hudson, MA – Hudson resident Sheryl Marrazzo will be competing in the Title 9 Sprint Triathlon in Hopkinton, MA on September 9, 2018 with her 15 year old son Jake, who has Duchenne Muscular Dystrophy and has been confined to a wheelchair since age 12. 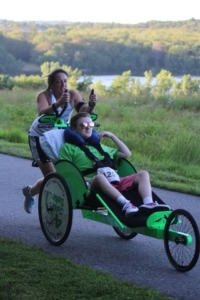 Sheryl will compete in the triathlon by pulling Jake in a raft for a 1/4 mile swim, then pulling him in a Team Hoyt custom-design race chair for a 10 mile bike ride and finally pushing him for 3.1 miles in the race chair. The inspiration for this challenge is when Jake has repeatedly told Sheryl, “I am frustrated on the sideline waiting for you to finish your Triathlons. Can you take me with you this year?” Sheryl agreed and began a 25-week training regimen with Unified Health & Performance owner Brendan Alward. So for the last 168 days or so, each day has been filled with swimming, running, biking and strength training for this 52 year old mother of three. Duchenne Muscular Dystrophy is a progressive muscle disorder that causes loss of muscle function and independence. It is the most common fatal genetic disorder diagnosed during childhood. Boys with Duchenne first lose their ability to walk, then their ability to use their arms and carry out everyday activities. 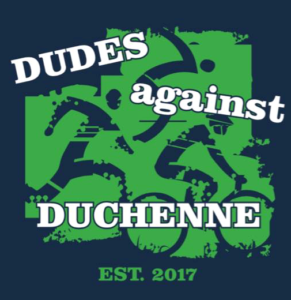 As they grow into young men, Duchenne boys typically succumb to the disease by their early 20s due to respiratory problems or heart failure. Sheryl joins the 80 other Gals for Cal team for the 5th year at the Title 9 Sprint Triathlon, raising money for the “Living Large” fund. This helps families living with Duchenne to get the things they need to live an accessible life. To support Sheryl & Jake with their efforts, visit the 4 Jake’s Sake Foundation and visit the Gals for Cal team to learn more about this great organization. 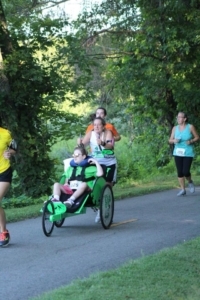 Yesterday was our first official 5k with our new Team Hoyt Running Chair! It was hot and crowded, but we managed a personal best and beat our last run by 2 minutes!! Jake kept asking me when I was going to go faster!! Did the best I could kid…speed in progress!!! People kept saying I don’t know how you do it (pushing a 35 pound chair and a 110 pound kid) but I know how…I do it 4 Jake & Tyler’s Sake!! 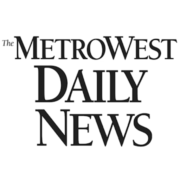 This article was written by Jonathan Phelps in the Metrowest Daily News and published on Apr 29, 2018 at 7:09 PM. HUDSON — During a run along the rail trail earlier this spring, Jake Marrazzo spurred his mother on as she started training for an upcoming triathlon. As a casual jogger, Sheryl Marrazzo had a quick answer for her 15-year-old son. “I’m going as fast as I can,” she said. 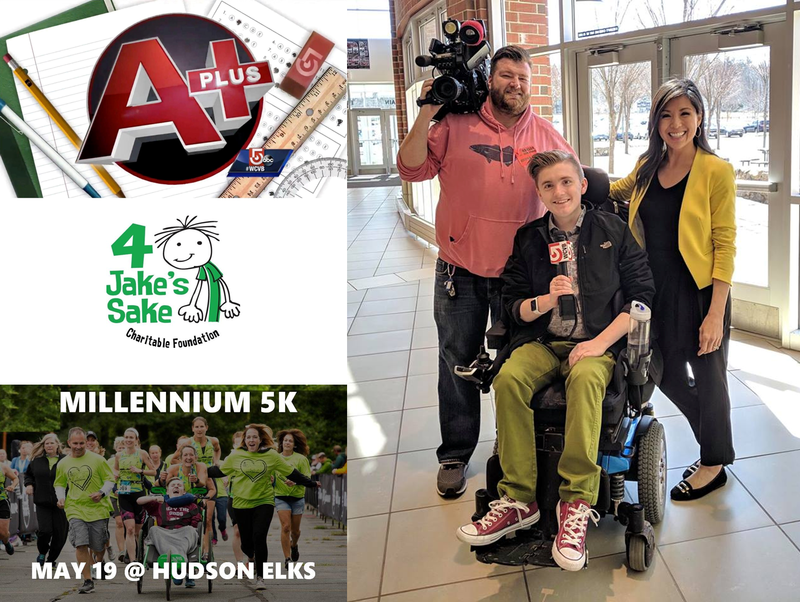 Jake, a freshman at Hudson High School, has been unable to walk since April 2015 after being diagnosed with Duchenne Muscular Dystrophy in January 2011 — a few days before his 8th birthday. The disease is a genetic disorder characterized by progressive muscle degeneration and weakness, according to the Muscular Dystrophy Association. Please visit the Metrowest Daily News to read the rest of this article. This article was written by Paul Burton and published on WBZ-TV on November 6, 2015 at 6:14 pm. Visit WBZ-TV to read the rest of this article.